School holidays: From February 9 to March 9, 2019 and From April 6 to May 4, 2019. Period June to September included. 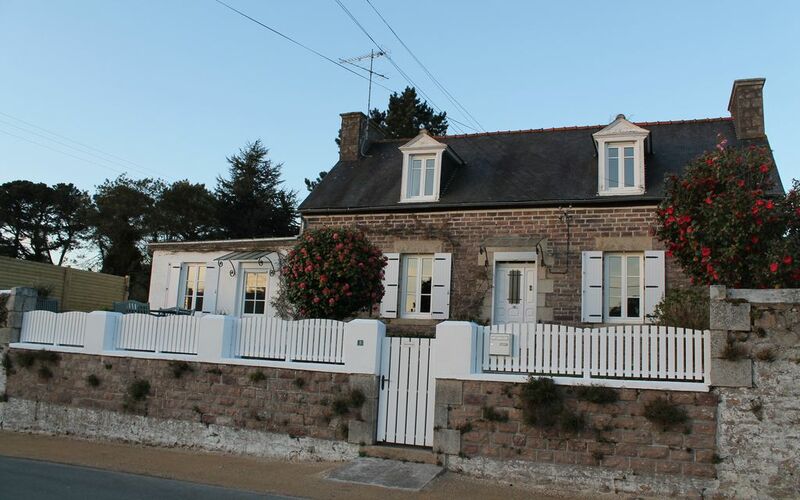 Discover this pleasant country house, in the hills of Paimpol, fully renovated in 2013 and nicely done. The cottage, comfortable, can accommodate 6 people. On the ground floor, you will have a bedroom (double bed 160), a bathroom with shower, toilet, a fully equipped kitchen and a large living room with direct access to the south facing terrace. The floor includes two bedrooms (double beds 140), one equipped with a shower with water point, the other with a bathroom with bath and toilet. Guests can enjoy an outdoor wooden terrace of 30 m2 south, a garden and a veranda equipped for indoor games (table tennis, darts). The rental has a private parking .Classified four stars by the federation of tourist offices. The lodging is classified four stars by the federation of the tourist offices. We stayed at this delightful house at October half term with our two children. We were met by the owner who gave us a tour of the house and told us about the local facilities and attractions. The house was immaculate and far bigger than the pictures show. The bedrooms were large and individually dressed for our children, the beds were new and very comfortable. Nice big kitchen with everything you would need, even home made cider and pastries! Lovely bright lounge with good t.v stereo and dvd player, board games and books. The front of the house has a lovely decked area which has the sun all day, perfect for early morning coffee watching the sun rise and set for dinner in the evening. The rear of the house has a play room with table tennis table and a very big garden for the children to explore with loads of parking. The location was very good, nice quiet area to walk around, the abbey ten minutes walk and Paimpol less than five minutes drive. Lots for us to do here with great beaches, restaurants and boat trips, everything within a twenty minute drive. After several trips to Brittany this is by far the best we have stayed in and would recommend to anyone visiting Paimpol, and will definitely return. Nous avons passé une très belle semaine dans votre gîte. Nous avons été très bien accueillis, la maison est charmante, confortablement équipée et joliment décorée. La literie est très confortable et la localisation idéale ! Nous reviendrons pour nous y ressourcer ! Gîte vraiment au Top pour 5 ou 6 personnes! Et oui ce gîte est très bien équipé, très fonctionnel et très spacieux pour 2 voire 3 couples.Ceci grâce aux 3 grandes chambres et surtout aux 3 cabinets de toilette qui sont un plus indéniable pour respecter l'intimité et le confort des occupants. La vaste cuisine avec tout le matériel nécessaire permet de préparer très facilement des repas qui peuvent être pris sur la terrasse verdoyante attenante au salon, ce qui est aussi très pratique pour l'apéro! Accueil très chaleureux de la charmante propriétaire qui nous a donné, en plus d'un excellent far breton (le meilleur que nous ayant dégusté , sans comparaison avec les pâtissiers ou les restos )de nombreux conseils pratiques. Très belle maison. Un havre de paix. Vous vous y sentirez comme chez vous, voir mieux peut-être ! De nombreux endroits à proximité à visiter. Allez-y les yeux fermés ! Très bon accueil avec cidre et flan breton. Notre hôte nous a expliqué avec passion tous les trésors de la région. La maison est très lumineuse et très bien équipée. Nous avons séjourné à 5 adultes pendant deux semaines avec tout l’espace nécessaire. Belle terrasse et jardin fleuri. Très bonne location à recommander. Merci beaucoup pour ces belles vacances.